Geochronology, the study of the age of geologic materials, is critical to understanding events in our planet’s history, the rates of both past and ongoing geologic processes, and the relationships between different processes. The many methods of geochronology in use today are based on established principles of physics and biology. The most broadly useful methods that can determine quantitative ages (as opposed to relative ages) are based on natural radioactivity and are termed radioisotopic dating methods. The two radioisotope dating techniques most important for much of geologic time are the U/Pb and Ar/Ar methods, based on the natural radioactivity of the elements uranium (U) and potassium (K), respectively. 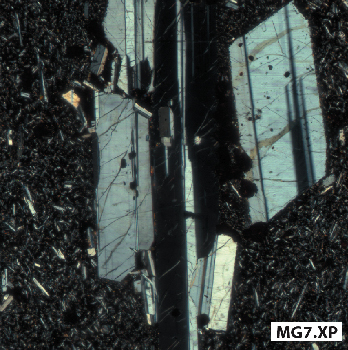 Polarized light photomicrograph of plagioclase crystals in a lava from the Neral Formation of the Deccan Traps. Image area is 1 cm x 1 cm. Photo courtesy of Paul Renne. For dating lavas such as those composing the Deccan Traps, the Ar/Ar method is advantageous because potassium is always present in the lavas, usually in concentrations between 0.1 and 0.5 % by weight. The potassium in these lavas is most concentrated in the mineral plagioclase (see photo), which occurs in all of the lavas. This method involves separating the plagioclase from the lavas by crushing as much as 5 kg of rock into fragments smaller than 2 mm, followed by sieving into different size fractions. After the optimal size fraction is selected, the sample is rinsed in weak nitric or hydrofluoric acid, and subjected to magnetic and heavy liquid separations. Finally, individual plagioclase grains are selected by hand under a microscope, and as much as 50 mg, comprising hundreds to thousands of grains, is chosen for analysis. Thus, in principle, any arbitrary Deccan lava can be dated, as long as its plagioclase is unaltered by weathering or other post-eruption processes, and the crystals have grown to sufficient size that their separation is practical. The Ar/Ar (more formally, the 40Ar/39Ar) method (McDougall and Harrison, 1999; Renne, 2006) is based on the decay of the potassium isotope 40K into an isotope of the noble gas argon, 40Ar. This decay process has a half-life of about 2.8 billion years. Knowing the half-life allows us to calculate the age of the rock based on the 40Ar/40K ratio in a sample. The 40Ar/39Ar method is so named because a proportion of the “parent” isotope 40K in a sample is first converted to 39Ar using neutron radiation in a nuclear reactor. This enables the isotope ratio 40Ar/39Ar to be used as a proxy for the 40Ar/40K ratio. Determining the ratio between two isotopes of the same element using a mass spectrometer can be done more precisely than for different elements. This is because argon can be released for spectrometry from a sample in steps by heating it to progressively higher temperatures, and an age can be calculated for each step. This pattern of incremental ages (i.e., the sample’s age spectrum) allows us to detect open system behavior which could lead to inaccurate ages. Shown here are the age spectra from two analyses of the same plagioclase shown above in the photomicrograph. Each step age is shown as a box with a length corresponding to the relative amount of argon released and height corresponding to the estimated uncertainty in age. All the steps from each age spectrum are in good agreement and are termed plateau ages. These results indicate that the plagioclase has remained a closed system since eruption and that the age is reliable. To achieve maximum precision, as many as eight such age spectra may be generated from a single sample. Geochronology is one of the most fundamental aspects of this project. Ongoing work aims to further constrain where the Cretaceous-Paleogene boundary occurs within in the sequence of lava flows, which will enable testing our hypothesis (Richards et al., 2015; Renne et al., 2015) that a fundamental change in the magmatic system was triggered by the Chicxulub impact. Improved geochronology is also aimed at better constraining the tempo of eruptions and the geographic spread of eruptions over time. McDougall, I. and T. M. Harrison, 1999, Geochronology and thermochronology by the 40Ar/39Ar method (2nd Edition), Oxford Univ. Press, 261 pp. Renne, P.R., C. J. Sprain, M. A. Richards, S. Self, L. Vanderkluysen, and K. Pande, 2015, State-shift in Deccan volcanism at the Cretaceous-Paleogene boundary possibly induced by impact, Science, 350, 76-78. Renne, P.R., 2006, Progress and Challenges in K-Ar and 40Ar/39Ar Geochronology, in Geochronology: Emerging Opportunities (T.D. Olszewski, Ed., Paleontological Society Papers, 12, 47-66. Richards, M.A., W. Alvarez, S. Self, L. Karlstrom, P. R. Renne, M. Manga, C. J. Sprain, J. Smit, L. Vanderkluysen, and S. A. Gibson, 2015, Triggering of the Largest Deccan Eruptions by the Chicxulub Impact, Geological Society of America Bulletin, 127, 1507-1520.